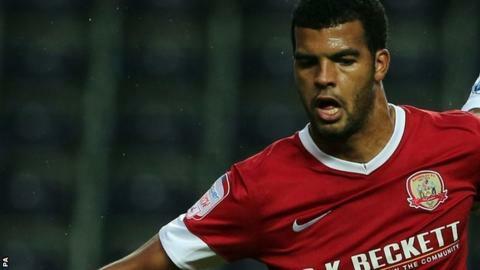 Barnsley overcame the dismissal of Bobby Hassell to beat Bristol City and record their second win of the season. The visitors had scored eight in three games before this match but fell behind to a close-range header from Jacob Mellis five minutes after half-time. Hassell was shown a straight red card soon after following an off-the-ball incident with Robins striker Jon Stead. Barnsley had only 12 senior players available but they held on for the three points. The home side fielded a weakened starting XI because David Perkins, Luke Steele, Matty Done, Jim McNulty and Jim O'Brien were all unavailable. Fresh from an impressive 4-2 win against Cardiff, Bristol City - fourth before kick-off - were hoping to consolidate their strong start. They began well with Sam Baldock clearing the crossbar after connecting with Mark Wilson's corner and Stead trying his luck from 25 yards, only to be denied by goalkeeper Ben Alnwick. After Craig Davies wasted an opening for Barnsley, Mellis drove straight at Tom Heaton from just inside the area. Mellis wasted two more opportunities but, after a period of dominance from the hosts, he was not to be denied, powering a header home from Martin Cranie's right-wing cross. Hassell's dismissal gave the visitors fresh impetus and after Baldock brought a comfortable stop from Alnwick, Cole Skuse's effort was blocked by Scott Wiseman. Substitute Steven Davies came close to equalising for City with his first touch, but his header went inches wide from six yards after good work from Greg Cunningham. Davies then struck the bar with a 25-yard free-kick late on, but Barnsley survived.